From our Kitchen to your concert stage: thundering hills and butterfly wings sing both old and new for you: a little sea nos, some four part harmonies - add original and traditional tunes on fiddle, whistles, mandolin, bohdran, guitar, and electric bass. Although we are not all of Irish descent, everyone who performs on this CD is a grandchild of someone who came over to America on a boat, pursued by poverty or the failed politics of the old world, looking for a chance. Our grandparents arrived here with the name of a town, an address, perhaps a much read letter which stated that they were welcome, that there was work to be found, and that someone would be expecting them. Other than that, they had their hopes, a small cardboard chest filled with a life’s belongings, and a pocketful of lint. Been following the Kitchen for years and this is their best CD yet. The quality, the variety of music, both traditional and original songs is just great. They are one of the best Irish groups in all of the midwest and this CD makes you feel like you are visiting Ireland every time you listen. Having purchased this cd for myself at Christmas time, it has spent alot of time in the Bose at work. From the first track to the last the quality of the recording by these musicians is excellent. The energy and commitment to each piece comes through in the work. I don't have a large collection of Irish music, but this cd has me looking to buy more! This was one of the most beautiful cd's i've ever listened to. I've grown up in an irish family and because of that i've heard A LOT of irish music. This cd left it all behind. I am a huge fan of Kennedy's Kitchen and especially love their original songs. Delighted to have been introduced to KK...we love them ...so much so that most of our family received them for Christmas ...now being listened to in UK and NZ! This CD has the rare virtue of having every single song that is a pleasure to one's ears. Well done from an Australian. This is what Irish music is-Most excellent! This cd makes the listener want to hear the next recording. this is what you would want to hear in Irish music, and our Kennedy members Love it! I heard Roger the Shrubber on Marc Gunn's Irish and Celtic Music Podcast #39 and I had to have the whole CD. 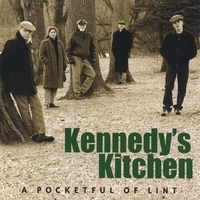 Another great CD from Kennedy's Kitchen! Thanks for another great CD. I must say Kennedy's Kitchen CDs are some of my favorites. They are very down-to-earth, not the glitzy over-produced Irish stuff one usually hears. I like the original songs and the tune sets are well done. Keep up the good work - it just gets better. My daughter finds your music soothing so she listens to it before going to bed! Good Stuff!